Four security personnel died and 11 others were injured after Naxals triggered a landmine blast in Chhattisgarh's Dantewada district today. The security personnel, belonging to Chhattisgarh Armed Force, were travelling in an anti-landmine vehicle near Cholnar village in the district when it crossed over a landmine planted by Naxals, police said. The injured security personnel have been moved to a hospital. Two of them are said to be critical. Sources say the Naxals used a lot of explosives to blow the anti-landmine vehicle. "A landmine vehicle was exploded by Naxals. Police officials reached the spot and took the injured to the hospital. We have received the information that four jawans have died and 11 are injured. The jawans replied to the firing. The Naxals ran away from there," said RK Vij, Additional Director General, Naxal Operations. Today's attack by Naxals in Chhattisgarh is the third in as many days. Late last night, Naxals attacked a Border Security Force (BSF) team killing a jawan in the insurgency-hit Kanker district. Naxals had opened fire on security personnel who were on patrolling duty near the Chhote Baithiya BSF camp, Kanker Superintendent of Police Jitendra Singh Meena told Press Trust of India. 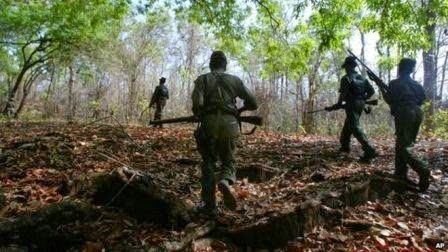 On Saturday, seven Special Task Force (STF) personnel were killed and 10 others injured when Naxals ambushed them in the forests of restive Pidmel village under Polampalli, around 450 kilometres from state capital Raipur. Naxals on Sunday set on fire 18 vehicles engaged in mining work in Kanker district, 140 km from Raipur. However, no one was hurt in that attack.